Instructors and graduates of the KPD Citizens Police Academy, December 19, 2101. 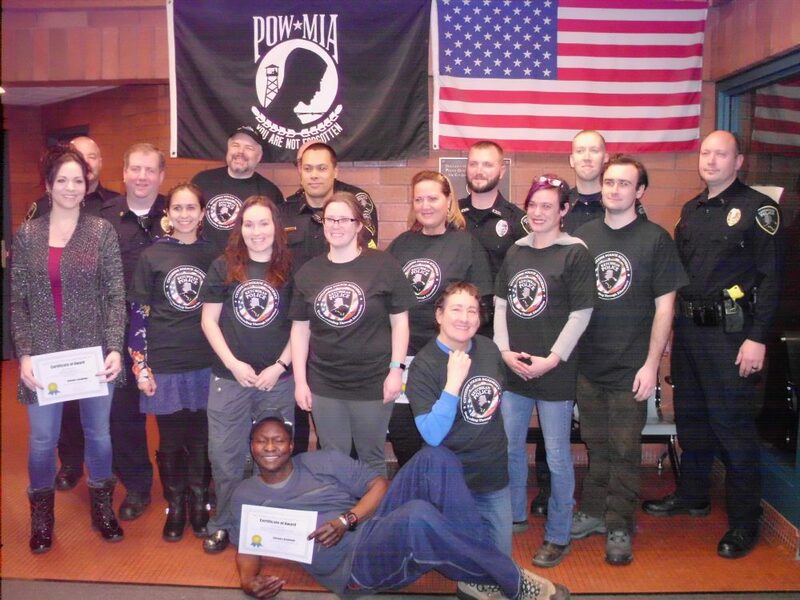 Last fall, the Ketchikan Police Department held its first-ever Citizen’s Academy. The seven-week course introduced participants to various aspects of police work including drug investigations, use of force, and firearms. 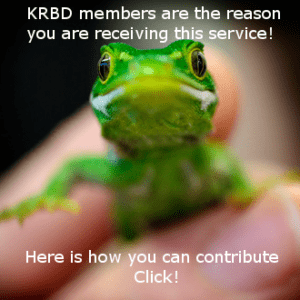 I was a member of the academy and have this report on my experience with crime scene processing. The purpose of the academy isn’t to train participants to become police officers, it’s to educate the public about how the Ketchikan Police Department works. Sixteen people were accepted into the academy. Each week a different topic was introduced, with two-hour classroom sessions on Tuesday nights, and practicals Saturday afternoons. Week four was dedicated to evidence and crime scene processing. Deputy Police Chief Josh Dossett and Sergeant Carlos Rojas led the class. Rojas focused on photographing a crime scene, explaining the importance of capturing a photo record before processing a scene. He says it’s important to have both raw and JPEG files. Deputy Police Chief Josh Dossett demonstrates how to dust for fingerprints (KRBD staff photo by Maria Dudzak). Rojas says raw files contain all the data and cannot be manipulated. They can be referenced if there are any questions about the validity of a photograph. 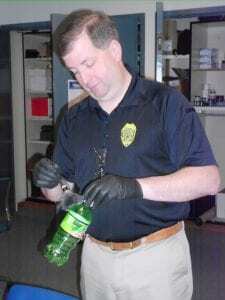 Dossett demonstrated how to take fingerprints off a plastic bottle, and discussed collecting evidence. Evidence includes wound marks, gunshot residue, fingerprints, dirt, hair, fibers, and blood spatter. Dossett says it’s important to understand that forensic analysis is not like what’s seen in movies or on TV. 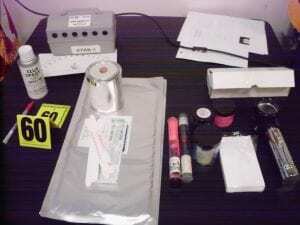 Some of the tools used to gather evidence at a crime scene (KRBD staff photo by Maria Dudzak). One way to make blood glow is to use a substance called luminol. If trace blood is suspected, a camera is set on a tripod and, after careful preparation, luminol is sprayed. To see how it works, the group gathered in a tile shower at the police station where blood had been smeared on the walls and washed away. A few small spots were visible, but the wall otherwise appeared clean. The lights were turned off, and luminol sprayed. We could see palm prints, smears and fingerprints. Rojas emphasized that if you use luminol, you only have one chance at getting a photograph since it runs down the wall and destroys the blood evidence. He and Dossett say you need also to gather DNA evidence first. After the demonstrations, we split into groups to try out what we learned. We were given kits to collect DNA samples, evidence bags, cameras, fingerprint kits and other materials, and headed to the KPD garage. Four crime scenes were set up. On top of large sheets of brown paper lay evidence. Our site contained a crowbar, plastic drink bottle, cigarette butts, footprints and blood spatter. Rojas says it’s important to first survey the scene and systematically collect evidence. I was on a team with Ashley Bush, A.J. Pierce, and Doussi Nguerdjeoubel. Pierce took photographs while Bush logged photos. Ashley Bush and Doussi Nguerdjeoubel dust for fingerprints (KRBD staff photo by Maria Dudzak). As we went along, we realized we should place metric rulers in each of the photos to show the size of blood droplets and other evidence. We continued to document evidence. It took about an hour to process the scene. The KPD plans to hold its next Citizen’s Police Academy in the spring. Those interested in learning more can contact Deputy Police Chief Josh Dossett at 225-6631.